(Former) General Post Office, Dundee. Walter Wood Robertson (1845-1907) of H. M. Office of Works. 1895-98. Category B listed building. John Gifford describes it as a "[h]uge freely detailed Franco-Italian Renaissance" structure of "pale polished ashlar," and goes on to quote an amusing contemporary comment from The Builder noting its heaping up of details: "columns and pilasters, strings and cornices, square windows and circular-headed windows, dormers, domes, turrets and vases, carving and sculpture" and so on (107). Note, however, that elsewhere it is considered to be "more Flemish" in detail ("Walter Wood Robertson"). 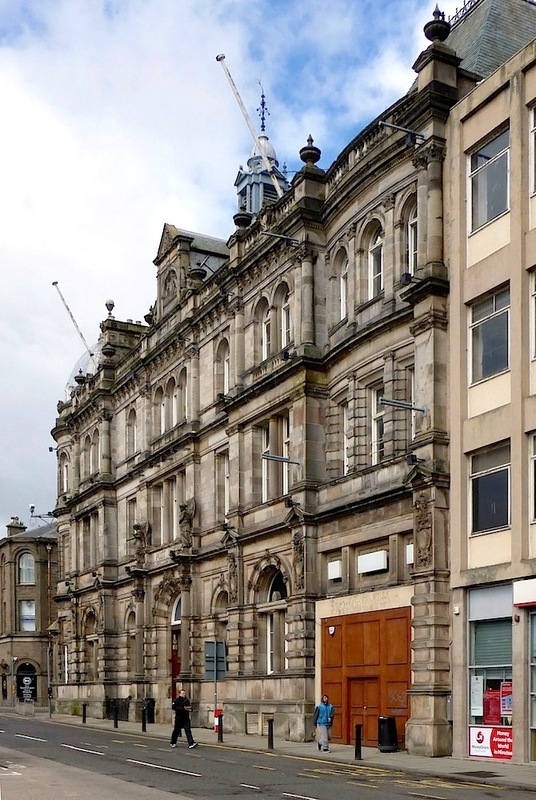 The large post offices here, and at Perth and Greenock, were Robertson's most important works. This one stands on the corner of Meadowside and Constitution Road, Dundee. In fact, such rich detailing was the very height of architectural fashion at this time, and made a statement both about Dundee and the postal service itself. 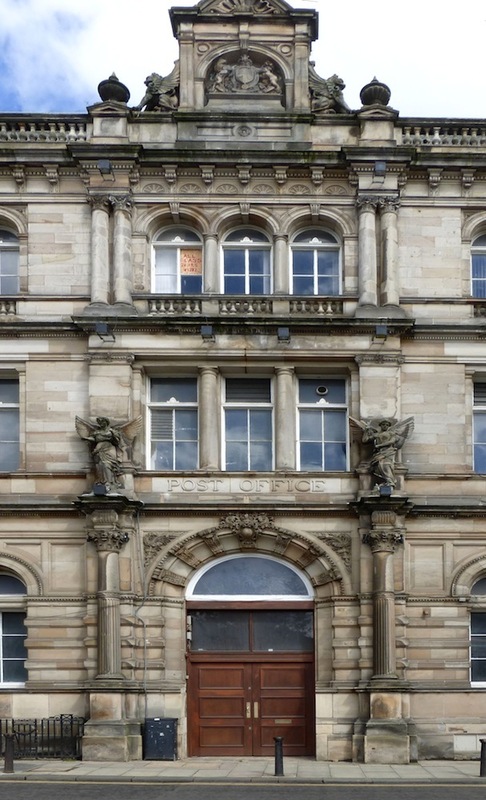 The sculptures of angels on the façade are a particular delight: the one on the left holds a post-horn and a letter, and the one on the right holds thunderbolts, to represent the telegraph department. "4 Meadowside, Head Post Office, Dundee." British Listed Buildings. Web. 1 December 2016. "Walter Wood Robertson." Dictionary of Scottish Architects. Web. 2 December 2016.